Tree trimming or wood cutting is a familiar job to gardeners and lumberjacks. For that reason, they need pole saws to cut high branches and thick pieces of wood quickly and easily without using a ladder. In the this wonderful age of technology, there is a wide range of gardening supplies that use electricity, including electric pole saws. Not only do they diminish the risk of being injured, but they also help to cut or trim things more efficiently thanks to their advanced features. Many manufacturers have produced useful electric pole saws for gardeners. They come in a variety of price ranges and qualities. This might have you a little confused when it comes to buying the best one for your garden. 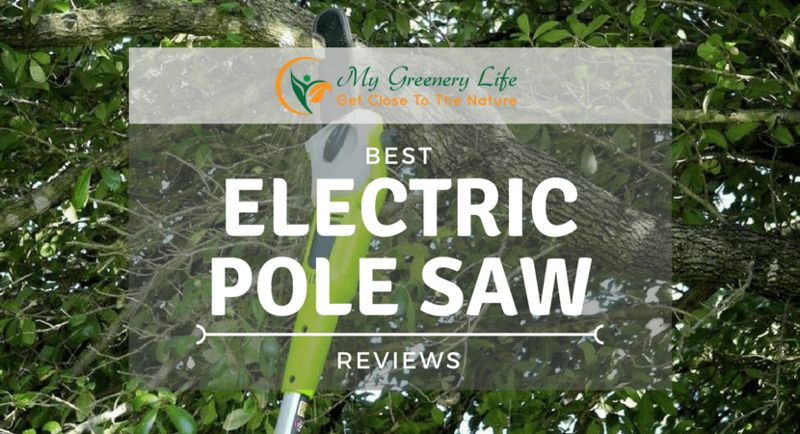 In this post, we’re going to introduce you to the top 5 best electric pole saw reviews 2019 so that you can refer to the list and make your own decision. This feature does not seem to affect your garden work to a great extent, but you should be fully informed to be able to make the best decision. On the market, there are pole saws with a detachable chainsaw and those that cannot be removed. A detachable model will offer the greater mobility since you can easily carry the saw alone. Also, it’s not always easy and safe to work with a long pole, so a detachable model will give you greater control when dealing with tough branches. With the fixed pole saws, the benefit is that they feel easier to put on your shoulders. Be sure to check out our electric pole saw reviews below to make the best decision. An electric pole saw is a combination of two main parts: pole and saw. The pole length decides the height that pruners can reach. That means that the longer it is, the higher the branches can be cut. But don’t think that that the longest pole will suit your job best. Normally, a pole which is 8 to 12 feet in length is enough. When trimming trees, the weight of the pole saw can significantly influence your endurance. You may not find it heavy until you feel tired after working hard. So, don’t forget to consider the weight you can stand for the whole cutting time. The majority of electric pole saws on the market weigh less than 10 pounds, so that is good news. This depends on many parts of a pole saw, including the guide bar, bar tip, saw chain, tension adjustment screw and throttle control. You can get a good idea of how it works based on the materials, shape and capacity on the packaging. Corded pole saws are suitable for those who want something powerful that can work for hours without worrying about running out of energy. Anyone who intends to buy this kind should take time to work out the distance they want their saws to reach in order to buy the one which has a long enough power cord. Users are confined to a small area around the electricity source. It seems that the cordless kind cannot be compared with the corded one in terms of power, but there is something to turn the tables around. Thanks to their Lithium-Ion battery, there is no need for a power cord and an outlet when you operate the machine. The result is that you can take it to anywhere you want. Users are not confined to a small area near an electricity source. Nevertheless, there is no best electric pole saw for all jobs. Check your garden and decide on the best one yourself. I hope my electric pole saw reviews below can help you. Oil container allows users to see the liquid level inside. The cover of the handle can fall apart. 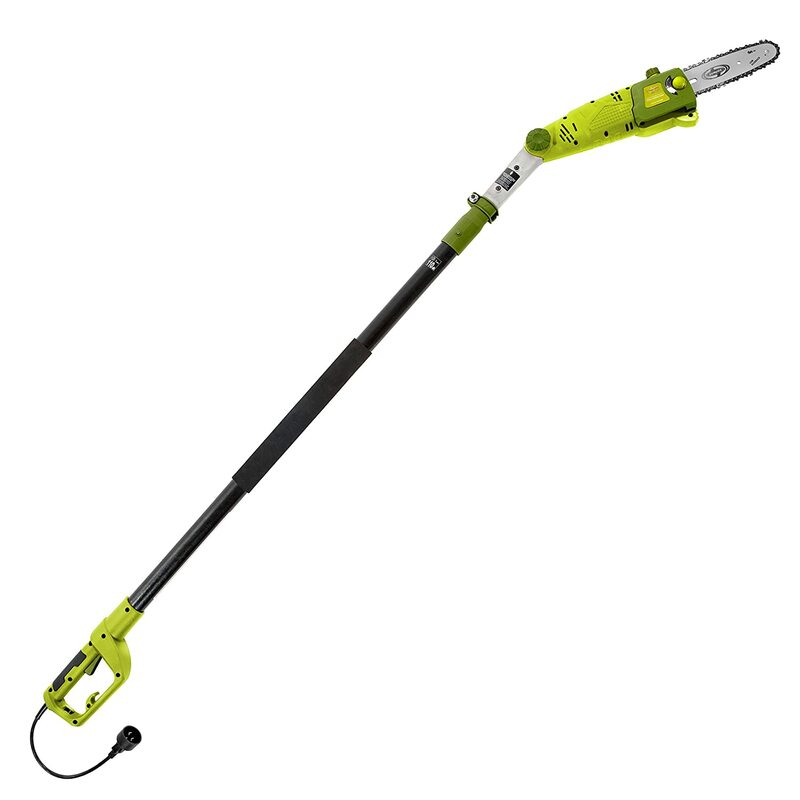 This device possesses plenty of wonderful features, making it worth being in the best electric pole saw list. The pole can extend to 8 feet, and the users will be able to reach 15 feet overhead. It is just the right thing to buy when you want to manage thin logs or overhanging branches. That being said, you can actually use this to ace branches that measure up to 7.5 inches in thickness as it has a 6.5-Amp motor. Another special feature is the Oregon cutting bar and chain that can oil themselves to ensure smooth operations. Let’s examine more useful details from the numerous positive electric pole saw reviews for this one. One outstanding feature is its collapsible pole. How convenient it is for us to be able to shorten the pole when we need to stand closer to a branch. Other products with fixed poles can be heavy and can put the users into uncomfortable, and even dangerous positions when they have to control a long saw. Another handy factor is that the chain does not easily or suddenly slip off the track like some other products. Even keen gardeners get irritated every time they have to halt work to put the chain back in the right place. This process can take up to 10 precious minutes. With Sun Joe SWJ800E, you will be spared that ordeal. This product is an ideal option for dealing with small limbs that are situated in hard-to-access places. It helps you easily defeat stubborn branches at the height of up to 15 feet, which is one among many reasons why it’s the best electric pole saw ever. The motor is a powerful beast, but is also easy to operate. The chainsaw is designed to be removed effortlessly without a need for cumbersome tools. The pole is made of both fiberglass and aluminum, while the central section boasts heavy duty fiberglass and is very well-built. It is sturdy and stiff for a good operation, and the oiler runs smoothly without any significant problems. This is important because users can have serious problems if they cannot get the oiling done well. The positive electric pole saw reviews for this product don’t lie! It cuts relatively thick branches, like a champion and at a rapid speed, too. Also, the detachable part is extremely convenient for carrying around and getting small jobs done easily. This product is unique in many ways. Firstly, it has a specially designed auto-tension chain mechanism for extending the life of the bar as well as the chain. The handle can be rotated to make pruning easier. It is also engineered to be as lightweight and easy to operate as possible. Secondly, this small yet powerful device is multifunctional. It is ideal for light or medium jobs such as lambing, trimming and cleaning up the yard. The detachable pole saw makes it handy for all kinds of jobs at various distances. 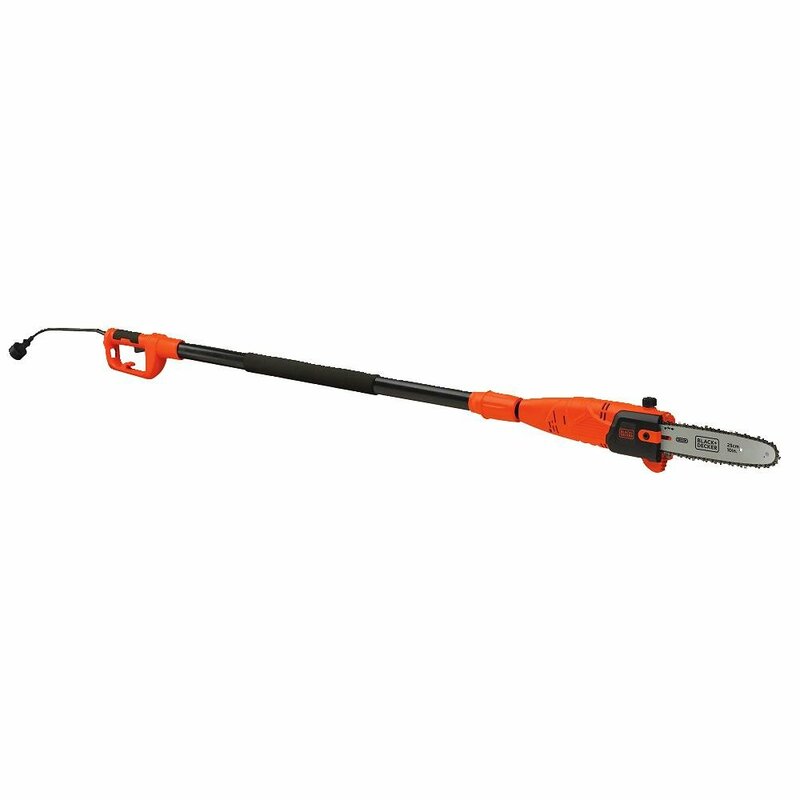 The 8-Amp powerful engine cuts through a lot of medium size branches at a good speed, which satisfies many customers. Plus, the pole can stretch up to 8 feet, and it does a good job dealing with branches in tight places, which bigger tools cannot do. What’s more? This machine is clean because it does not leak much oil, almost none! It is also a silent killer with not much noise made during operation. It does deserve the title best electric pole saw with many advantages. Here is another great option to consider for light duty work around your yard or garden. 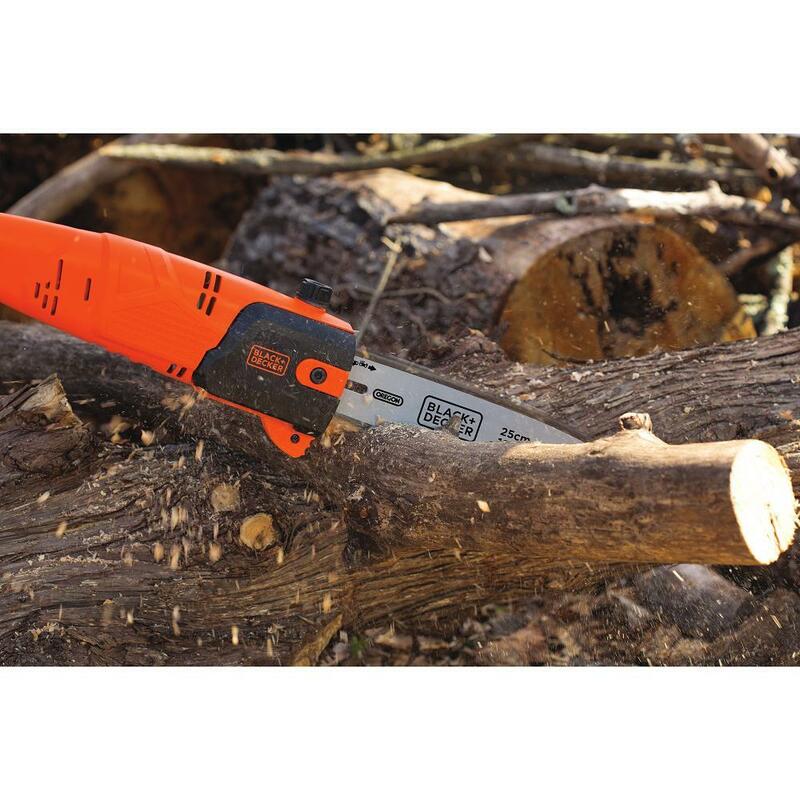 It is created to master the job of cutting small logs as well as overhanging branches. However, it is longer than the previous model (WORX WG309) with a reach of 9.4 feet and 15 feet overhead. One special factor that other models of these electric pole saw reviews don’t possess is the adjustable head which can be positioned at angles 0, 15 and 30. 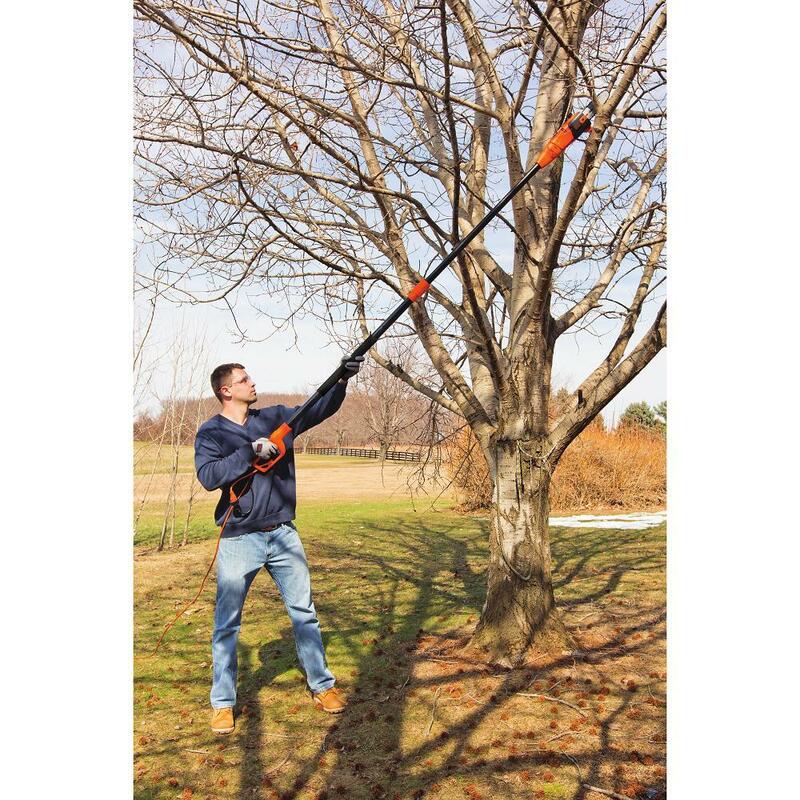 Although the motor runs at 6.5 Amps which is less powerful than WORX WG309, it is enough to manage 5-7 inch branches. Sun Joe SWJ802E is light enough to be used by both men and women of medium size. A customer measuring 5’2’’ could handle the pole saw with few difficulties. It is powerful, lightweight and, importantly, has little to no leak. It is certainly among the best electric pole saws on the market right now. The final contestant in our electric pole saw review comes from one of the world’s best companies for power tools and accessories – BLACK+DECKER. Their products are well-known for their high quality, and this one – the PP610 – is not an exception. Firstly, the inline powerful 6.5-Amp motor does a great job of cutting touch branches. Secondly, thanks to the 10" Oregon low-kickback bar and chain, the device improves its cutting speed as well as minimizes vibration during operation. 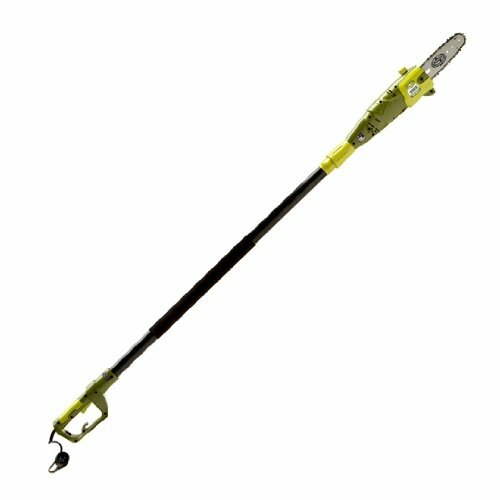 Thanks to the 9.5’ pole, it is also ideal for dealing with branches in hard-to-access positions. Moreover, the automatic lubrication mechanism guarantees that your saw is well oiled and runs smoothly. Customers have reported great work done by the oiling system, and that’s why this product is among the best electric pole saws. That’s all for now! We have worked hard to bring you the best electric pole saw reviews 2019. These products have more plus points than minus points, but you do need to consider your garden’s demands carefully to opt for the most suitable one. If you have taken note of our tips for choosing the best electric pole saw and gone through the product reviews, you are well on your way to owning the number one electric pole saw. See you next time with even more informative posts. Goodbye and thank you for reading!